On Tuesday 17th May, we were very pleased to welcome Peter Oborne, the former chief political commentator of The Telegraph and Professor Eugene Rogan, Professor of Modern Middle Eastern History at the University of Oxford and Director of the Middle East Centre at St Antony’s College to GSF. 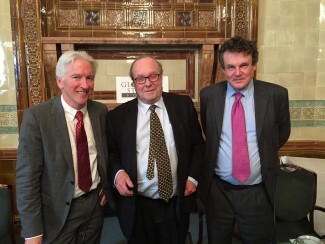 They spoke in a debate entitled ‘The 1916 Sykes-Picot Agreement And Its Legacy In The Middle East Today’ which was chaired by Lord Lothian. To listen to the discussion again, please click Sykes-Picot debate.